My favorite was the Crispy Buffalo Cauliflower appetizer, a TR vegetarian twist on chicken wings. It features cauliflower, lightly breaded and fried, tossed in a spicy wing sauce, and served with Bleu cheese dressing, carrots and celery. You won’t even miss the chicken (I didn’t). 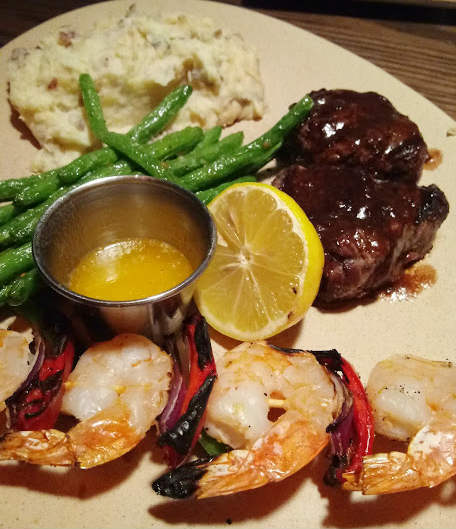 Fans of Surf-n-Turf will want to dig into the Filet Medallions with Diane Sauce and Grilled Shrimp with 3-Citrus Butter entree. It’s the sauces that take these classics to the next level. The rich Diane sauce adds an extra savory layer to the steak, while the citrus butter sauce featuring lemon, lime & orange juice pairs perfectly with the grilled shrimp. All on one plate? Yes, please. Speaking of seafood, the Harissa-Glazed Grilled Salmon entree is a wonderful dish. 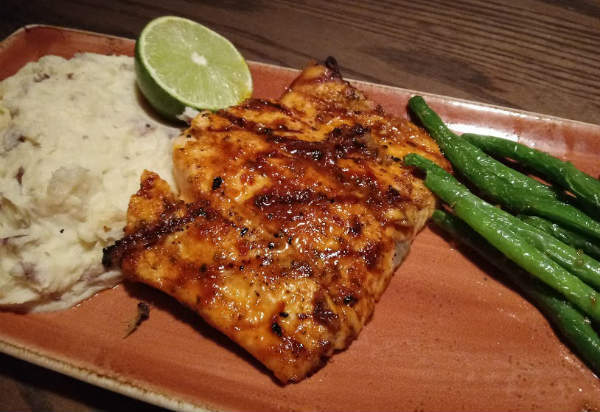 The fresh grilled salmon is coated in a mixture of African Harissa chili paste, maple syrup. and a touch of lime juice. A delicious blend of savory with hints of sweet and a pop of zing. Both entrees are served with yummy mashed potatoes and seared garlic green beans. 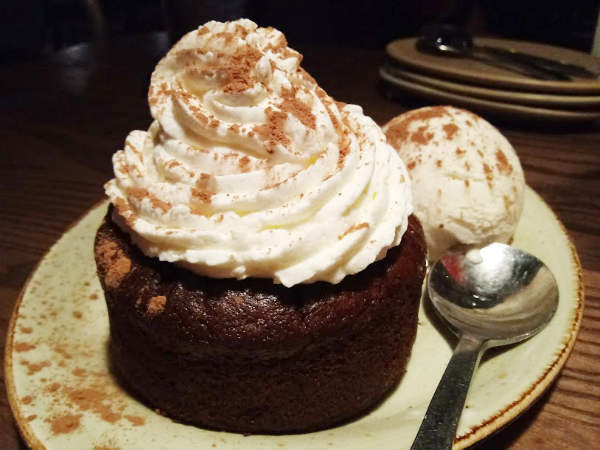 If you have room for dessert, the Sweet Heat Chocolate Cake is a great finisher. This rich chocolate cherry cake is kicked up a notch with a bit of chili spice. The heat won’t make you cry but it’s a nice background contrast to the chocolate. It’s served with basil whipped cream and vanilla ice cream. For those 21 and up, the New Classics menu also features two cocktails chosen to pair nicely with the above dishes. 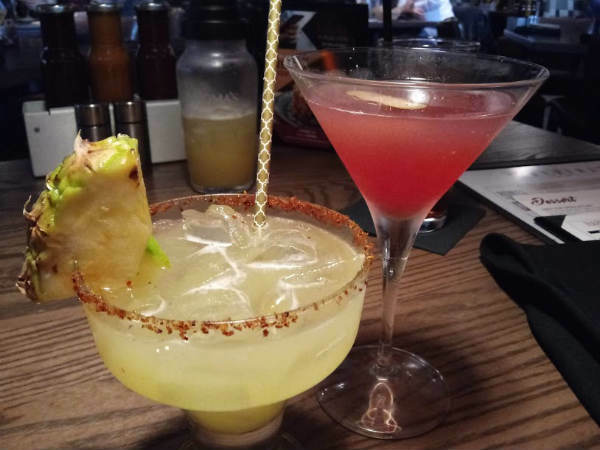 The Spiced Pineapple Romarita is a perfect match with the Harissa-Glazed Grilled Salmon, down to the spiced rim. With the filet and shrimp, try the Chambord Manhattan, a classic cocktail from the early 1900s featuring Knob Creek bourbon and updated with a hint of sweet raspberry via Chambord raspberry liqueur. 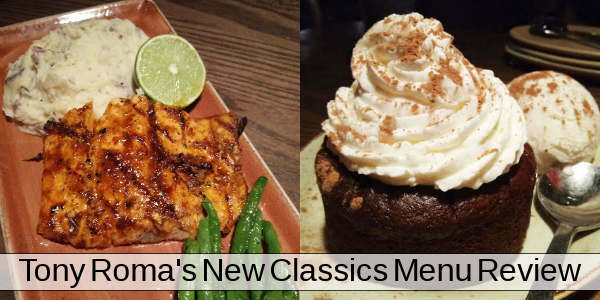 The New Classics Menu is available through April 28, 2019. To find your nearest location, visit TonyRomas.com.